Despite the conclusion by US intelligence that there is no evidence of Russian involvement in the destruction of the Malaysian airliner and all lives onboard, Washington is escalating the crisis and shepherding the World toward war. Twenty-two US senators have introduced into the 113th Congress, Second Session, a bill, S.2277, “To prevent further Russian aggression toward Ukraine and other sovereign states in Europe and Eurasia, and for other purposes.” The bill is before the Committee on Foreign Relations. The existence of “Russian aggression” is assumed, not demonstrated. Neither Breedlove nor the senators make any reference to Russian war plans for an attack on Europe or any other countries. There are no references to Russian position papers and documents setting forth a Russian expansionist ideology or a belief declared by Moscow that Russians are “exceptional, indispensable people” with the right to exercise hegemony over the world. No evidence is presented that Russia has infiltrated the communication systems of the entire world for spy purposes. There is no evidence that Putin has Obama’s or Obama’s daughters’ private cell phone conversations or that Russia downloads US corporate secrets for the benefit of Russian businesses. Nevertheless, the NATO commander and US senators see an urgent need to create blitzkrieg capability for NATO on Russia’s borders. Senate bill 2277 consists of three titles: “Reinvigorating the Nato Alliance,” “Deterring Further Russian Aggression in Europe,” and “Hardening Ukraine and other European and Eurasian States Against Russian Aggression.” Who do you think wrote this bill? Hint: it wasn’t the senators or their staffs. Title I deals with strengthening US force posture in Europe and Eurasia and strengthening the NATO alliance, with accelerating the construction of ABM (anti-ballistic missile) bases on Russia’s borders so as to degrade the Russian strategic nuclear deterrent, and to provide more money for Poland and the Baltic states and strengthen US-German cooperation on global security issues, that is, to make certain that the German military is incorporated as part of the US empire military force. Title II is about confronting “Russian aggression in Europe” with sanctions and with financial and diplomatic “support for Russian democracy and civil society organizations,” which means to pump billions of dollars into NGOs (non-governmental organizations) that can be used to destabilize Russia in the way that Washington used the NGOs it funded in Ukraine to overthrow the elected government. For 20 years Russian government negligence permitted Washington to organize fifth columns inside Russia that pose as human rights organizations, etc. Title III deals with military and intelligence assistance for Ukraine, putting Ukraine, Georgia, and Moldova on a NATO track, expediting US natural gas exports in order to erase European and Eurasian energy dependence on Russia, preventing recognition of Crimea as again a part of Russia, expanding broadcasting (propaganda) into Russian areas, and again “support for democracy and civil society organizations in countries of the former Soviet Union,” which means to use money to subvert the Russian federation. Ukraine as it currently exists is an ahistorical state with artificial boundaries. Ukraine presently consists of part of what was once a larger entity plus former Russian provinces added to the Ukrainian Soviet Republic by Soviet leaders. When the Soviet Union collapsed and Russia permitted Ukraine’s independence, under US pressure Russia mistakenly permitted Ukraine to take with it the former Russian provinces. Washington and its European vassals have consistently misrepresented the situation in Ukraine and denied their responsibility for the violence, instead placing all blame on Russia. But it is not Russia that is conducting bombing raids and attacking provinces with troops, tanks, and artillery. Just as Israel’s current military assault against Palestinian civilians fails to evoke criticism from Washington, European governments, and the Western media, Kiev’s assault on the former Russian provinces goes unreported and uncriticized. Indeed, it appears that few Americans are even aware that Kiev is attacking civilian areas of the provinces that wish to return to their mother country. Sanctions should be imposed on Kiev, from which the military violence originates. Instead, Kiev is receiving financial and military support, and sanctions are placed on Russia which is not militarily involved in the situation. When the outbreak of violence against the former Russian provinces began, the Russian Duma voted Putin the power to intervene militarily. Instead of using this power, Putin requested that the Duma rescind the power, which the Duma did. Putin preferred to deal with the problem diplomatically in a reasonable and unprovocative manner. Putin has received neither respect nor appreciation for encouraging a non-violent resolution of the unfortunate Ukrainian situation created by Washington’s coup against a democratically elected government that was only months away from a chance to elect a different government. The sanctions that Washington has applied and that Washington is pressuring its European puppets to join send the wrong information to Kiev. It tells Kiev that the West approves and encourages Kiev’s determination to resolve its differences with the former Russian provinces with violence rather than with negotiation. This means war will continue, and that is clearly Washington’s intent. The latest reports are that US military advisors will soon be in Ukraine to aid the conquest of the former Russian provinces that are in revolt. The presstitute nature of the Western media ensures that the bulk of the American and European populations will remain in the grip of Washington’s anti-Russian propaganda. At some point the Russian government will have to face the fact that it doesn’t have “Western partners.” Russia has Western enemies who are being organized to isolate Russia, to injure Russia economically and diplomatically, to surround Russia militarily, to destabilize Russia by calling the American-funded NGOs into the streets, and in the absence of a coup that installs an American puppet in Moscow to attack Russia with nuclear weapons. I respect Putin’s reliance on diplomacy and good will in the place of force. The problem with Putin’s approach is that Washington has no good will, so there is no reciprocity. Washington has an agenda. Europe consists of captive nations, and these nations are without leaders capable of breaking free of Washington’s agenda. with the purpose of recovering for Ukraine former provinces of Russia herself. When Washington says that Putin is responsible for downing the Malaysian airliner, Washington is correct in a way that Washington doesn’t suspect. Had Putin completed the task begun with Crimea and reunited the Russian provinces with Russia, there would have been no war during which an airliner could have been downed, whether by accident or as a plot to demonize Russia. Ukraine has no capability of confronting Russia militarily and had no alternative to accepting the reunification of the Russian territories. Europe would have witnessed a decisive Russian decision and would have put a great distance between itself and Washington’s provocative agenda. This European response would have precluded Washington’s ability to gradually escalate the crisis by gradually turning the temperature higher without the European frog jumping out of the pot. In its dealings with Washington Europe has grown accustomed to the efficacy of bribes, threats, and coercion. Captive nations are inured to diplomacy’s impotence. Europeans see diplomacy as the weak card played by the weak party. And, of course, all the Europeans want money, which Washington prints with abandon. Russia and China are disadvantaged in their conflict with Washington. Russia and China have emerged from tyranny. People in both countries were influenced by American cold war propaganda. Both countries have educated people who think that America has freedom, democracy, justice, civil liberty, economic wellbeing and is a welcoming friend of other countries that want the same thing. This is a dangerous delusion. Washington has an agenda. Washington has put in place a police state to suppress its own population, and Washington believes that history has conveyed the right to Washington to exercise hegemony over the world. Last year President Obama declared to the world that he sincerely believes that America is the exceptional nation on whose leadership the world depends. In other words, all other countries and peoples are unexceptional. Their voices are unimportant. Their aspirations are best served by Washington’s leadership. Those who disagree–Russia, China, Iran, and the new entity ISIL–are regarded by Washington as obstacles to history’s purpose. Anything, whether an idea or a country, that is in the way of Washington is in the way of History’s Purpose and must be run over. In the late 18th and early 19th centuries Europe faced the determination of the French Revolution to impose Liberty, Equality, Fraternity upon Europe. Today Washington’s ambition is larger. 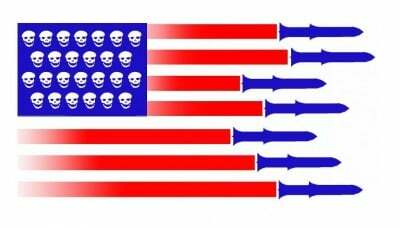 The ambition is to impose Washington’s hegemony on the entire world. Unless Russia and China submit, this means war.